This eclipse trip was arranged by TravelQuest, who I have traveled with before, so I knew ahead of time that this solar eclipse cruise aboard the Paul Gauguin would be top-notch, and it was. 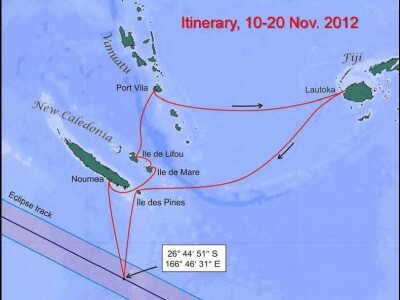 They have seven staff aboard, so the on-board presentations ensure we will be well-prepared for the big day on the 14th, when we will be south of New Caledonia in the South Pacific to watch the Total Solar Eclipse. Being aboard a ship dedicated to eclipse chasing means we will be in a prime location, and be able to avoid any weather which might hamper us in one location by simply sailing to a better one as required. I’ll leave it up to the staff to decide that one – they well know what we are all after! For those of you wish to read about my whole trip, including the time I spent pre-cruise and post-cruise in Fiji, then you should start by clicking this link: 2012 Canada to Fiji flights. You will still get to read all about the 10 day eclipse cruise, but you will also experience my whole three weeks of travels in Fiji and the South Pacific by following the links at the bottom of each page to the next post. This is a 10 day cruise aboard a ship which will only have about 320 passengers aboard, so I am looking forward to being pampered and spoiled by the service staff. Being able to share the solar eclipse experience with fellow dedicated eclipse chasers will only enhance the experience. The last time I observed a total solar eclipse was from the Libyan Sahara Desert in 2006 under ideal conditions: Eclipse Day in the Sahara. I think the predicted chance of cloud cover was less than 10% at the Sahara location, whereas on this trip, the chance of cloud cover is closer to 50%, however the chance of thick cloud cover is about 20%. Totality will last 3 minutes at our location, which is pretty well the longest anyone will experience for this particular solar eclipse, given its track is mainly over the water of the South Pacific. Most eclipse chasers will be on the Australian coast north of Cairns to observe this event. They have considerably more weather decisions to make than us…I expect to hear some exciting stories from them of having to make runs inland to avoid the clouds, but I wish everyone all the best nonetheless. 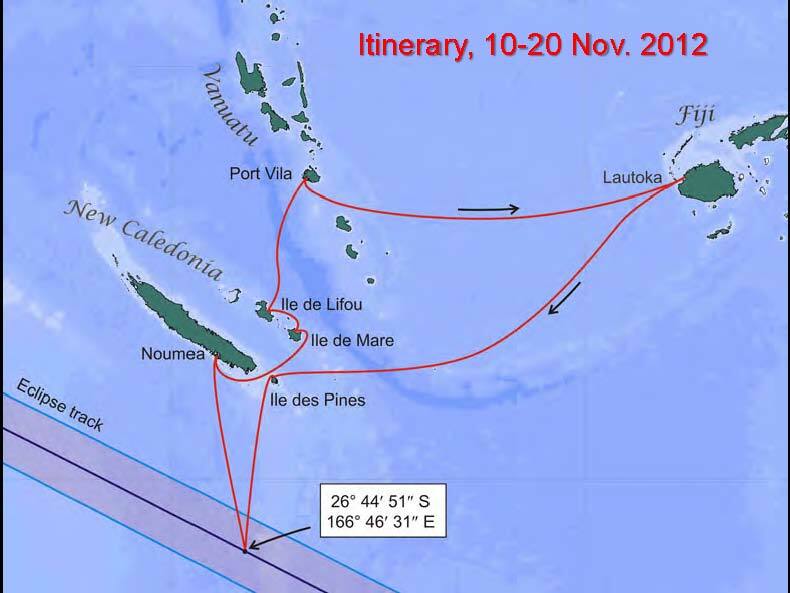 The ship makes four ports of call in New Caledonia as well as visiting Port Vila in Vanuatu. I am very much looking forward to visiting these ports, since I sailed aboard Holland America’s Volendam in 2010 to some of these same ports. It is with considerable anticipation that I want to experience these magical places again, since the snorkelling and scenery is second to none, the people are very friendly and welcoming, and I will get to experience two new ports of call in New Caledonia. After observing and photographing the eclipse from the ship’s deck on the 14th, we will settle into a more traditional South Pacific cruise, enjoying the above-mentioned ports of call before arriving back in Lautoka, Fiji six days later. Rather than returning home after disembarking the cruise, I make arrangements to stay in Fiji a further week. I had always wanted to experience the Yasawa Islands, located just off the NW coast of Viti Levu, where we disembark the ship, so this was an ideal time to experience this part of Fiji.